Polaiteoir agus ceannaire cogaidh Sasanach ab ea Winston Spencer Churchill, (30 Samhain 1874 — 24 Eanáir 1965). 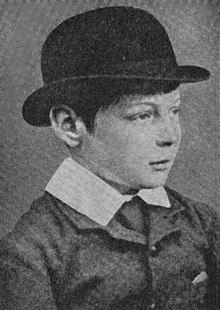 Mac le státaire Sasanach eile Randolph Churchill, a bhí ann. Chaith sé tréimhse ina oifigeach airm san India, agus ghlac sé páirt i gCath Omdurman i gcoinne lucht leanúna an Mhahdaí sa tSúdáin freisin. Ina dhiaidh sin, ghlac sé páirt i Cogadh na mBórach. Ón mbliain 1900 anuas, bhí sé ina Fheisire don Pháirtí Choimeádach, ach thréig sé an páirtí sin ar mhaithe leis na Liobrálaigh sa bhliain 1904. Bhí sé ina fho-rúnaí do na coilíneachtaí. Sa bhliain 1911, cuireadh i mbun na hAimiréalachta é, agus choinnigh sé an post sin go dtí an Chéad Chogadh Domhanda. Bhí sé ar dhuine acu siúd a cheap an plean chun cathéadan nua a oscailt i nGallipoli i gcoinne na hImpireachta Otamánaí sa bhliain 1915, ach theip ar an bplean seo go tubaisteach. Bhí sé ina Rúnaí Stáit do chúrsaí na cogaíochta sna blianta 1919—1921, agus, mar sin, b'ar a chrann-san a thit sé an Conradh Angla-Éireannach a shíniú sa bhliain 1921. B'é an conradh seo a chuir tús le Saorstát Éireann. Bhí sé go mór i gcoinne na Réabhlóide Boilséiví, agus é á rá gur cheart an Boilséiveachas 'a thachtadh sa chliabhán'. D'fhill sé ó na Liobrálaigh go dtí an Páirtí Coimeádach sa bhliain 1925. Bhí sé ina Sheansailéir Státchiste sa bhliain 1925 nuair a ghlac an Ríocht Aontaithe leis an Órchaighdeán in athuair agus le linn na hollstailce i 1926. Thosaigh blianta deacra a shaoil sa bhliain 1931 nuair a theip air post a fháil sa rialtas. Bhí sé ina Phríomh-Aire ar an mBreatain an chuid ba mhó de bhlianta an Dara Cogadh Domhanda 1940—1945, tar éis dó teacht i gcomharbas ar Neville Chamberlain. Bhí sé ina shiombail do mhuintir na Breataine i rith an chogaidh. Chaill sé olltoghchán na bliana 1945 i gcoinne Pháirtí an Lucht Oibre faoi Clement Attlee. Tar éis dó roinnt blianta a chaitheamh sa fhreasúra, ghnóthaigh sé olltoghchán Deireadh Fómhair sa bhliain 1951, agus bhain sé amach oifig an phríomh-aire arís. D'fhan sé i mbun na hoifige sin go dtí an bhliain 1955. Bronnadh Duais Nobel na Litríochta air sa bhliain 1953 as ucht na gcuimhní cinn a d'fhoilsigh sé idir na blianta 1948 agus 1953. Fuair sé bás ar an 24 Eanáir 1965. Rugadh Churchill i bPálás Blenheim i Sír Oxford, don Tiarna Randolph Spencer Churchill agus dá bhean Mheiriceánach, Jeanette ("Jennie") Jerome. B'é Spencer-Churchill sloinne an teaghlaigh ar fad, go hoifigiúil, ach ba nós leis an athair agus lena mhac riamh gan ach "Churchill" a úsáid sa saol poiblí. Teaghlach diúcach ab ea muintir Churchill, nó b'é John Churchill, an chéad Diúc Marlborough, a chuir tús leis an teaghlach an chéad uair, thiar sa seachtú haois déag. Ní raibh ceachtar dá thuismitheoirí sásta mórán bábaíochta a thabhairt do Winston óg, agus chuaigh uaigneas a chéad óige go mór mór i bhfeidhm air. Mhair iarsmaí an uaignis seo ag luí air go lá a bháis, de réir a chuimhní cinn. Chaith Winston óg an chuid ba mhó dá óige i scoileanna cónaitheacha, agus an scolaíocht ag éirí leis go measartha. Ní raibh mórán maithe ann le léann ná Laidin a thógáil, ach bhí sé ina fhear mór Béarla agus scríbhneoireachta riamh. Siúd is nach raibh caidreamh maith aige lena thuismitheoirí, a raibh sé ag santú a ngrá gan mórán freagra a fháil, bhí sé an-luiteach lena bhuime, Elizabeth Ann Everest, a dtugadh sé "Woom" uirthi. Bhí suim ag Winston i matamaitic agus i stair, ach má bhí féin, ní raibh meas an mhadra ag a mhúinteoir Laidine air, agus ó ba rud é go raibh an Laidin ar an ábhar ba tábhachtaí i scoileanna an ama, b'ionann sin is a rá go raibh sé ina dhrochscoláire de réir an chaighdeáin chomhaimseartha. Sin é an cineál míchlú a ghreamaigh de, go háirithe de dheasca an drochmheasa a léirigh a athair dó. Mar sin féin, chuaigh an fear óg ag foghlaim saighdiúireachta in acadamh na n-oifigeach i Sandhurst. Chaith sé tréimhse ina oifigeach airm san India, agus ghlac sé páirt i gCath Omdurman i gcoinne lucht leanúna an Mhahdi sa tSúdáin freisin, ar an dara lá de Mheán Fómhair, 1898. Bhí sé ina oifigeach airm, agus é ag obair don nuachtán Sasanach The Morning Post ag an am céanna. D'éirigh leis bheith páirteach san ionsaí, cé nár theastaigh ón gceannaire Briotanach, Horatio Kitchener go mbeadh Churchill ann. Ina leabhar The River War ("Cogadh na hAbhann") thug sé cur síos cuimsitheach ar an ionsaí (Ziegler, 1973). Ina dhiaidh sin, ghlac sé páirt i gCogadh na mBórach, agus cimíodh é. D'éirigh leis éalú ó na Bóraigh, ar ndóigh, agus ba mhór an t-ábhar adhnua é san am an teitheadh a rinne sé. Chuaigh sé le hiriseoireacht chogaidh thíos ansin, agus ar ball beag, fuair sé é féin ina chime ag na Bóraigh, i ndiaidh an ionsaí a thug siadsan faoi thraein armúrtha Arm na Breataine. D'éirigh le Churchill óg, áfach, a éalú a dhéanamh as an mbraighdeanas seo, agus nuair a chuala an saol mór ar an eachtra seo, bhí ainm Winston Churchill i mbéal na ndaoine ar fad, mar a bheadh laoch náisiúnta ann. Tar éis tubaiste Gallipoli chuaigh Churchill ar ais ag saighdiúireacht in airm na Briotáine i gcoinne na Gearmánaigh san Fhrainc. In olltoghcháin na bliana 1906, bhain Churchill amach suíochán i Manchain. Chaith sé seal ina Fho-Rúnaí Stáit do na Coilíneachtaí, nuair a bhí Henry Campbell-Bannerman ina Phríomh-Aire Liobrálach. Bhí meas ag baill an Chaibinéid ar Churchill, áfach, agus nuair a tháinig Herbert Asquith i gcomharbas ar Campbell-Bannerman mar Phríomh-Aire, rinneadh ball den Chaibinéad de Churchill, is é sin, an Rúnaí Stáit Trádála agus Tionsclaíochta. In éineacht agus i gcomhar le Seansailéir an Státchiste David Lloyd George, chrom Churchill ar leasuithe radacacha sóisialta a chur i gcrích. Sa bhliain 1910, fuair Churchill céim suas nua, nó cuireadh i mbun na gcúrsaí inmheánacha é mar Rúnaí Baile. Ansin, tharraing sé criticeoireacht áirithe air féin, le linn na n-imeachtaí ar tugadh "Léigear Shráid Sidney" orthu, sa bhliain 1911. Is é an scéal a bhí ann ná gur éirigh ina chogadh dearg idir drong d'ainrialaithe Laitviacha a bhí i ndiaidh a seadú a dhéanamh sa Bhreatain, agus saighdiúirí Briotanacha. Nuair a cuireadh léigear ar na hainrialaithe i Sráid Sidney, thosaigh siad ag loscadh urchair leis na saighdiúirí, agus chuaigh Churchill i láthair an chatha, beag beann ar an tine a bhí á scaoileadh as an teach imdhruidte. Lochtaíodh é faoin éadromántacht seo, chomh maith leis an dóigh ar choisc sé ar an mbriogáid dóiteáin an tine a mhúchadh nuair a bhí teach na sceimhlitheoirí ar bharr lasrach. Sa bhliain 1911, cuireadh Churchill i gceannas ar an Aimiréalacht, agus b'ansin a d'fhan sé go dtí an Chéad Chogadh Domhanda. Rinne sé an-iarracht an cabhlach a dhéanamh cothrom le dáta. Mar shampla, theastaigh uaidh ola a chur in áit an ghuail mar bhreosla do na longa, rud a d'éiligh gaisce innealtóireachta. D'úsáid sé ciste an chabhlaigh leis an chéad tanc cogaidh a fhorbairt, rud nár thaitin le cách, nó síleadh, ag an am, go raibh sé ag claonchasadh airgid agus ag trasnú isteach ar dhlínse an Airm. Thairis sin, bhí Churchill ar duine acu siúd a phleanáil an iarracht thubaisteach leandála ag Gallipoli. Chuaigh trúpaí Astrálacha agus Nua-Shéalannacha i dtír in aice le Gallipoli chun caolas Dardanelles a shealbhú agus a dhúnadh ar na longa Gearmánacha, ach fuair na saighdiúirí rompu cosaint láidir na nGearmánach agus na dTuirceach a rinne spior spear den landáil ar fad. Maraíodh leathchéad míle saighdiúir i lámhach na bpiléar Gearmánach, agus cuireadh cuid mhór den mhilleán ar Churchill. Thugadh muintir na saighdiúirí marbha "Búistéir Gallipoli" ar mo dhuine, i ndiaidh an chatha. B'éigean do Churchill éirí as an oifig nuair a chuir Asquith an chéad rialtas eile le chéile. Comhrialtas ab ea é a raibh na Coimeádaigh ag glacadh páirte ann, agus is é an coinníoll a chuir siad ar Astuith ná nach suifidís in aon rialtas le Churchill. Mar sin, thréig Churchill an rialtas, mar a héilíodh air. Chuaigh sé chun cogaidh chomh maith le duine, agus chaith sé roinnt ama ar fiannas ar an gcathéadan thiar. Ní thuigim an chonsaeit seo a bhíonn ar na daoine roimh úsáid an gháis. Nach é ár seasamh é i gcomhchainteanna na síochána féin go mbeidh an gás in úsáid feasta mar chuid den ghnáth-threalamh cogaidh? Nach cur i gcéill lom é bheith drogallach faoin deoirghás nach gcuirfidh an duine ach ag gol, nuair nach bhfuiltear ag síleadh a dhath den duine chéanna a stróiceadh as a chéile le bloghanna nimhe an phléascáin? Tá mé féin go mór mór i bhfách le gás nimhe a úsáid le treabhanna neamhshibhialta a choinneáil faoi smacht. An dóigh a maolóidh an gás ar mhisneach na ndaoine seo, is dócha gurb é seo an gléas is lú a mharóidh. Níl sé riachtanach leas a bhaint as aon chineál gás marfach, nó is leor gás a roghnú nach gcuirfidh ach an-mhíchompord ar na daoine leis an scanradh ceart a bhaint astu, gan aon mháchail bhuan a fhágáil ar aon duine acu. Faoin am seo, sna blianta 1919—1920, ghearr Churchill síos go mór ar an gcaiteachas cogaidh. Bhí sé an-bhuartha faoi fhorbairt pholaitiúil na Rúise san am seo, agus é den tuairim nár mhiste ladar a chur i gcúrsaí na tíre sin leis an mBoilséiveachas a thachtadh ina chliabhán. Bhí sé in ann áitiú ar an gCaibinéad gurbh é lár leasa na Breataine é fórsaí idirghabhála na Breataine a choinneáil ag obair sa Rúis chomh fada agus ab fhéidir, beag beann ar fhreasúra Pháirtí an Lucht Oibre. Sa bhliain 1920, i ndiaidh do na saighdiúirí Sasanacha glanadh amach as an Rúis, chuidigh Churchill leis na Polannaigh airm agus armlón a fháil ón mBreatain nuair a bhí siad ag cur cogaidh ar na Rúisigh faoin Úcráin. Sa bhliain 1920, rinneadh Stát-Rúnaí na gCoilíneachtaí de Churchill. Dá thoradh sin, b'eisean a shocraigh is a shínigh an Conradh Angla-Éireannach leis na hÉireannaigh—an conradh a chuir Saorstát Éireann ar bun. I Mí Dheireadh Fómhair den bhliain 1922, chuaigh Churchill faoi scian an mháinlia leis an aipindic a bhaint de, agus ag filleadh ón ospidéal dó fuair sé an rialtas scortha roimhe, agus olltoghchán nua ar na bacáin. Bhí an Páirtí Liobrálach ar tí titim as a chéile de dheasca na faicseanaíochta inmheánaí, agus níor éirigh an toghchánaíocht le Churchill. Sciob Edwin Scrymgeour, a bhí ina ionadaí do mhionpháirtí ólséantóireachta, suíochán Dhùn Dèagh ó Churchill, a fuair é féin fágtha gan Aireacht, gan Feisireacht, gan aipindic, mar a dúirt sé féin. Bhí Churchill ina iarrthóir arís in olltoghchán na bliana 1923, i dtoghlach Leicester, agus chaill sé an iarracht seo chomh maith. I rith an chéad bhliain eile, thosaigh sé ag dul leis na Coimeádaigh arís, cé gurbh fhearr leis, ar dtús, "Frith-Shóisialaí" nó "Bunreachtúlaí" a thabhairt air féin. In Olltoghchán na bliana 1924, vótáil muintir Epping isteach é mar Bhunreachtúlaí a raibh na Coimeádaigh ag tacú leis. Sula raibh an chéad bhliain eile istigh, bhí sé ina bhall den Pháirtí Choimeádach arís, agus é ag magadh nach éacht mór é an chéad pháirtí a thréigean ar mhaithe leis an dara páirtí, ach go raibh beartaíocht de dhíth leis an dara pháirtí a atréigean ar mhaithe leis an chéad pháirtí. Rinneadh Aire Airgeadais, nó Seansailéir an Státchíste, de Churchill arís, ach nuair a d'fhill an Ríocht Aontaithe ar an órchaighdeán faoina cheannas-san, tharraing an beart seo díbhoilsciú, dífhostaíocht agus trioblóidí oibreachas ina dhiaidh. Sa bhliain 1926, chuaigh na mianadóirí ar stailc in aghaidh Churchill, agus tháinig na ceardchumainn eile sna sálaí acu go dtí go raibh an tír ar fad curtha ó obair ag an ollstailc. Nuair a chinn Churchill ar an órchaighdeán a athbheochan, spreag sé an t-eacanamaí clúiteach úd John Maynard Keynes chun criticeoireacht phoiblí a dhéanamh ar pholasaithe an Aire. Bhí Keynes den bharúil go dtarraingeodh athbheochan an órchaighdeáin géarchéim dhomhanda eacnamaíochta ina diaidh. Bhí an ceart ag Keynes, agus is é an rud a deireadh Churchill le súil ar ais ar na laethanta seo nár chinn sé ar chomhairle níos measa riamh lena lá ná comhairle an órchaighdeáin. Lena cheart a thabhairt do Churchill, ní raibh oideachas eacnamaíochta air, agus ní raibh sé go bunúsach ach ag leanúint chomhairle Mhontague Norman, a bhí i gceannas ar Bhanc Shasana ag an am. Bhí Churchill scanraithe roimh an gCumannachas, agus é den bharúil gur chóir smacht a chur ar na stailceoirí le meaisínghunnaí, leis an tír a tharrtháil. San am seo, chuir sé in iúl go raibh dáimh áirithe aige le Benito Mussolini, ó bhí sé den tuairim go mbeadh an Faisisteachas san Iodáil ina sciath chosanta in aghaidh choinscleo an Chumannachais. Chaill na Coimeádaigh olltoghchán na bliana 1929, agus sna blianta a tháinig ina dhiaidh sin, bhí Churchill ag easaontú le cinnirí an pháirtí faoi na taillí caomhnaitheacha custaim agus faoi rialtas dúchais na hIndia. Nuair a tháinig an Rialtas Náisiúnta le chéile faoi cheannas Ramsay Mac Donald sa bhliain 1931, níor tairgeadh aireacht ar bith dó ar an rialtas. Bhí an chuma ar an scéal go raibh a thréimhse istigh mar pholaiteoir, agus mar sin, chrom sé ar scríbhneoireacht, cosúil leis an mbeathaisnéis a scríobh sé faoina shinsear clúiteach John Churchill, chéad-Diúc Marlborough, agus stair na náisiún Béarla (A History of the English-Speaking Peoples). Bhí sé go tréan talcánta ag cur in aghaidh neamhspleáchas na hIndia. Ina dhiaidh sin, áfach, d'éirigh Adolf Hitler chomh bagarthach is nach dtiocfadh le Churchill dearmad a dhéanamh de a thuilleadh. Nuair a bhí an chuid eile den náisiún ag áitiú orthu féin go mbeadh sé indéanta Hitler a ghiúmaráil is a chealgadh chun coimhoibrithe, bhí Churchill ag tabhairt rabhaidh cheana féin faoi chomh riachtanach agus a bhí sé téisclim chogaidh a dhéanamh le haghaidh na troda a chaithfí a chur ar na Gearmánaigh an lá ab fhaide anonn. Nuair a thosaigh an cogadh, cuireadh Churchill i mbun chúrsaí an chabhlaigh, agus le linn an "Chogaidh Bhréige" roimh ruathair aeir na nGearmánach ar an mBreatain Mhór, tharraing sé níos mó súil air féin ná aon duine eile san oifig seo. Bhí Churchill inbharúla gur chóir Narvik, an cuan Ioruach, agus Kiruna, an chathair mhianadóireachta sa tSualainn, a shealbhú roimh theacht na nGearmánach. Ní raibh an chuid eile den rialtas ar aon tuairim leis, agus mar sin, ní dheachaigh na Sasanaigh i dtír i Narvik sula raibh na Gearmánaigh ag déanamh forghabhála ar an tír cheana féin. Mar sin, bhí na Naitsithe ábalta an Iorua a ghabháil agus ruaigeadh a chur ar na Sasanaigh ó Narvik. I mBealtaine 1940, agus na Gearmánaigh ag teannadh isteach tríd an mBeilg agus tríd an Ísiltír, tháinig sé chun solais nach raibh muintir na Breataine Móire sásta leis an dóigh a raibh an Príomh-Aire Chamberlain ag fearadh an chogaidh. D'éirigh Chamberlain as, agus b'é Churchill a tháinig i gcomharbas air. D'fháiltigh Churchill na páirtithe polaitiúla eile isteach sa rialtas nua, agus ós rud é nach raibh na cúrsaí cosanta agus cogaidh fágtha faoi aon duine amháin go dtí sin, ghlac sé air féin dualgaisí an aire cosanta chomh maith. D'fhág sé déantús agus táirgíocht na n-eitleán cogaidh faoina sheanchara, an Tiarna Beaverbrook. Ó bhí Beaverbrook ina fhear maith gnó agus eagraíochta, bhí sé in ann tionsclaíocht na Breataine Móire a shlógadh chun téisclime cogaidh. Ní féidir liom a dhath a thairiscint daoibh, ach doirteadh fola, bárcadh allais, agus gleann na ndeor. Mairfidh muid ag cosaint an oileáin seo againn, beag beann ar an deachú a chaithfidh muid a íoc. Cuirfidh muid cath orthu sna cladaí, cuirfidh muid cath orthu ar na háiteanna leaindeála, cuirfidh muid cath orthu sna páirceanna agus sna sráideanna, cuirfidh muid cath orthu thuas sna cnoic, agus ní bhrisfear an cath sin orainn choíche. Nuair a thosaigh Cath na Breataine Móire, agus na Gearmánaigh ag tabhairt ruathar aeir i ndiaidh a chéile faoin oileán, dúirt sé "nach raibh a leithéid de mhórán riamh faoina leithéid de chomaoin ag a leithéid de bheagán" - bhí sé ag tagairt don dóigh a raibh muintir na tíre ar fad faoi chomaoin ag eitleoirí an Aerfhórsa Ríoga. Bhí Churchill an-mhór le Franklin Delano Roosevelt, Uachtarán na Stát Aontaithe, rud a chuidigh leis soláthar ríthábhachtach treallaimh agus armálacha ó Mheiriceá a chinntiú don Bhreatain Mhór. Tháinig seisean agus Roosevelt le chéile ag dhá chruinniú straitéiseach déag, agus b'ag na cruinnithe seo a socraíodh polasaithe lárnacha an chogaidh, ar nós an tús áite a tugadh do chogadh na hEorpa, an Forógra Atlantach a chuir an chéad dúshraith le hECAT (NATO) agus Forógra na Náisiún Aontaithe. Chuir Churchill bun freisin le Coiste Feidhmitheach na nOibríochtaí Speisialta (SOE, Special Operations Executive), le sabaitéireacht a dhéanamh ar oibríochtaí cogaidh na nGearmánach sna tíortha a bhí forghafa ag na Naitsithe. D'éirigh sách maith leis an gcoiste seo, agus é ag comhoibriú go dlúth leis na gluaiseachtaí frithbheartaíochta sna tíortha forghafa. Smaoineamh de chuid Churchill ab ea é freisin na fórsaí commandó a bhunú. Ón taobh eile de, bhí alcólachas Churchill ag dul chun donais, agus an cogadh ag druidim chun deiridh. Chinn sé ar go leor droch-chomhairlí, agus fosta, bhí sé sásta faomhadh a thabhairt don léirscrios a rinne eitleáin bhuamála na Breataine ar chathair Dresden gan aon chúis cheart cogaíochta, nuair a bhí an cogadh féin beagnach thart, agus an chathair féin ag cur thar maoil le sibhialtaigh—teifigh ó chríocha tréigthe thoir na Gearmáine. Lena cheart a thabhairt do Churchill, is é an dearcadh a bhí ag na daoine san am gur cuidiú mór ab ea buamáil Dresden leis na comhghuaillithe Sóivéadacha. Churchill le Stailín agus Roosevelt ag Comhdháil Yalta sa bhliain 1945. Dealraíonn sé, freisin, go raibh milleán éigin ar Churchill as gorta mór Bengal sa bhliain 1943. Fuair thart ar thrí mhilliún de dhaoine bás de dheasca an ghorta seo a bhí cosúil le drochshaol na hÉireann ar go leor dóigheanna. Is é sin, tháinig meath ar na barra nuair a buaileadh an rís le tolgadh fungais, agus ní raibh Churchill sásta teacht chun tarrthála dóibh siúd a fágadh ar an mblár fholamh. Is follasach, áfach, gur chuir an cogadh go mór mór leis an easpa bia a rinne an ródach seo. Bhí Churchill fonnmhar, freisin, teorainneacha na Polainne a shocrú ar bhealach a thaitin le Stailín i bhfad níos mó ná leis na Polannaigh féin. Cuireadh bun leis an socrú seo nuair a tháinig Roosevelt, Churchill agus Stailín le chéile i gCasablanca sa bhliain 1943, ach is gnách leis na Polannaigh a rá gurb i gcruinniú mullaigh Yalta i dtús na bliana 1945 a "dhíol Churchill le Stailín" iad. Níor bhac Churchill le barúil an Rialtais Pholannaigh i Londain a iarraidh i dtaobh an tsocraithe seo. Go bunúsach, bhí Churchill féin barúlach go gcaithfí ceist na dteorainneacha in Oirthear na hEorpa a fhreagairt tríd na teorainneacha nua a tharraingt de réir na náisiúntachtaí. Mar sin, ós rud go raibh níos mó Bílearúisigh agus Úcráinigh ina gcónaí in Oirthear na Polainne, ní raibh sé as cosán a rá gurbh fhearr iad a chur in aon stát amháin leis na Bílearúisigh is na hÚcráinigh eile, mar atá, an tAontas Sóivéadach. Ba náir le Churchill, áfach, an dóigh ar fágadh na Cumannaigh ag rialú na Polainne i ndiaidh an chogaidh, beag beann ar rialtas dlíthiúil na Polainne i Londain. Thuig sé go rómhaith an feall a bhí imeartha aige in aghaidh a thola féin ar an chéad chomhghuaillí a bhí ag an mBreatain Mhór i dtús an chogaidh, ach ní raibh sé ábalta an feall a chosc sna cruinnithe mullaigh. Cé go raibh meas an laoich ar Churchill i ndiaidh an chogaidh, ní hionann sin is a rá nach raibh muintir a thíre in ann locht a fháil nó a aithint air. Bhí sé go tréan in aghaidh an stáit shoilíosaigh, an oideachais shaoir agus an leasa shóisialta. Bhí tuirse ar mhuintir na Breataine Móire i ndiaidh an chogaidh, áfach, agus iad ag santú an chirt agus an chothroim shóisialta ar chuir siad an oiread sin catha ar a shon. Ó bhí an chuma ar an scéal nach mbeadh Churchill sásta deachú an chogaidh a íoc leo, chaith siad as a oifig é agus vótáil siad isteach Clement Attlee agus Páirtí an Lucht Oibre i dtoghchán na bliana 1945. Níl gach staraí den tuairim, áfach, gurb é seasamh Churchill a chaill an toghchán air. Is fearr leosan a rá nach raibh na vótóirí míshásta le Churchill go pearsanta, ach lena pháirtí. Mura gcuirtear rialtas uiledhomhanda de chineál éigin ar bun leis na cogaí a chosc, is beag todhchaí a fheicim don tsíocháin agus do dhul chun cinn an chine dhaonna. Más féidir eagraíocht dhomhanda a chur ar bun a dtugtar aitheantas forleathan dá húdarás, ní bheidh aon teorainn leis an sult a bhainfidh gach aon duine as an saol. Ó Stettin - is é sin, cathair Szczecin i bPolainn an lae inniu - cois na Bailte go Trieste cois Mhuir Aidriad, thit cuirtín iarainn trasna na hEorpa. Ar an taobh eile den líne sin a fágadh príomhchathracha seanársa Lár agus Oirthear na hEorpa: Vársá, Beirlín, Prág, Vín, Budapest, Beograd, Bucureşti agus Sóifia, agus an daonra ina dtimpeall, tá siad go léir suite sa chuid den domhan nach féidir liom ach an sféar Sóivéadach a thabhairt uirthi. Bhí corrthónacht agus leadrán ar Churchill sna blianta a chaith sé san fhreasúra i ndiaidh an chogaidh. Nuair a chaill an Lucht Oibre olltoghchán na bliana 1951, d'fhill Churchill go dtí Sráid Uí Dhuinnín arís. Mhair sé ina Phríomh-Aire go dtí gur éirigh sé as an bpolaitíocht sa bhliain 1955. Le linn an téarma seo, d'athnuaigh sé an "caidreamh speisialta" leis na Stáit Aontaithe ar chuir sé bun leis i mblianta an chogaidh, agus é an-ghnóthach ag cruthú an eagair pholaitiúil iarchogaidh. Mar sin féin, fuair sé é féin in achrann i dtrioblóidí sna coilíneachtaí nár cheadaigh dó clú ceart a bhaint amach as cibé rud a d'éirigh leis go maith sa Bhreatain Mhór féin. B'é ba chúis leis na trioblóidí seo ná an dóigh a raibh cumhacht agus stádas na Breataine Móire ag trá sna cúrsaí idirnáisiúnta. Ós rud é gur fear Impireachta ab ea Churchill go smior, ba dual dó freagra na láimhe láidire a thabhairt ar ghéarchéimí den chineál seo. Thosaigh conspóid na hartola san Iaráin nuair a bhí Attlee ina Phríomh-Aire go fóill. I Márta 1951, chinn parlaimint na hIaráine an Comhlacht Artola Angla-Iaránach a náisiúnú - is é sin, an comhlacht agus gach ar bhain leis a shealbhú do stát na hIaráine. B'é an seanstátaire Mohammad Mossadegh ba mhó a bhí ar son an bhille áirithe seo, agus rinneadh príomh-aire na hIaráine de sa bhliain a bhí chugainn le tacaíocht an fhormhóir mhóir sa pharlaimint. Leis an gconspóid a shocrú, mhol an Chúirt Idirnáisiúnta comhghéilleadh: aitheantas a thabhairt don náisiúnú, agus brabús na hartola a roinnt go cothrom idir an Bhreatain Mhór agus an Iaráin. Dhiúltaigh Mossadegh don chomhréiteach seo, áfach, agus tháinig deireadh leis na comhchainteanna idir na hIaránaigh agus na Sasanaigh. Thosaigh na Sasanaigh uisce faoi thalamh a thógáil in aghaidh na hIaráine, agus iad ag útamáil leis an smaoineamh Mossadegh a chur ó chumhacht le cuidiú na seirbhísí rúnda. Ní raibh uachtarán na Stát Aontaithe, Harry Truman, róshásta leis an bhforbairt seo, ná ró-fhonnmhar chun cabhrú leis an mBreatain Mhór, ó bhí a aird féin ar chogadh na Cóiré ag an am. Mar sin féin, d'éirigh leis na Sasanaigh baghcat trádála a chur i bhfeidhm ar an Iaráin a rinne an-dochar d'eacnamaíocht na tíre. Nuair a tháinig Churchill ar ais mar Phríomh-Aire, chrom sé ar rialtas Mossadegh a chur ag guagaíl. Bhí an dá thaobh ag iarraidh fad a bhaint as an gconspóid le tairiscintí doghlactha, agus sa deireadh thiar thall, theip ar na comhchainteanna go hiomlán. Ansin, agus an damáiste a bhí á dhéanamh don Iaráin ag an gcosc trádála, thosaigh an t-arm agus an chuid de phairlimint na hIaráine a bhí fabhrach don Bhreatain Mhór, thosaigh siad pleananna a oibriú amach le Mossadegh a chur as oifig le lámh láidir. Bhí Winston Churchill agus a Aire Gnóthaí Eachtracha ag iarraidh an craiceann is a luach a bheith acu. Ó thaobh amháin, theastaigh uathu an Iaráin a chur ar bhealach a leasa i gcúrsaí polaitíochta agus eacnamaíochta - an tír a fhorbairt is a fheabhsú. Ón taobh eile de, ba leasc leo an Comhlacht Artola a fhágáil faoi smacht na nIaránach, siúd is gurb ar éigean a d'fhéadfaí an tír a fheabhsú gan airgead artola. Ar dtús, bhí siad ag tacú le Sayyid Zia, ó shíl siad go mbeadh sé indéanta gnóthaí a shocrú leis siúd, ach nuair a chuaigh an diospóireacht i bhfad, thosaigh siad ag tógáil uisce faoi thalamh leis an Arm. Mar sin, bhí rialtas Winston Churchill tar éis an plean céanna a ghlacadh chucu a bhí ag rialtas Attlee roimhe sin—is é sin, forghabháil chumhachta a chur i bhfeidhm in aghaidh Mossadegh. B'é sin Éirí Amach Mau Mau, mar a thugtar air in annalacha na staire. Ar an 17 Lúnasa 1952, cuireadh staid éigeandála i bhfeidhm ar an tír, agus tuilleadh fórsaí armtha ag teacht le heitleáin ón mBreatain Mhór in aghaidh an lae leis an éirí amach a chloí. Chuaigh na cúrsaí an oiread sin chun géaradais is go bhféadfá a rá go raibh an Chéinia ar bharr lasrach le cogadh cathartha. Sa bhliain 1953, rinne na ceannaircí ródach mór ar dhílseoirí ar de threibh Kikuyu iad. Chuir an t-ár seo—sléacht Lari, mar a thugtar air—malairt chuma ar fad ar pholaitíocht an éirí amach, agus fuair na Sasanaigh ar ais cuid den dea-chlú a bhí caillte acu i rith an chogaidh. B'é an cineál straitéis a bhí ag Churchill ná an lámh láidir mhíleata a imirt gan trócaire ar na ceannaircí agus na héilimh a shásamh a bhí ag na hAfraicigh a chur chun tosaigh ar dtús, go dtí an diúltú a fuair siad ó rialtas Attlee. Bhí bunadh na Malaeisia ag cur in aghaidh an choilíneachais Bhriotanaigh ón mbliain 1948 ar aghaidh. Géarchéim eile a bhí ann a fuair Churchill mar oidhreacht ón rialtas a bhí ann roimhe, agus rinne sé mar a rinne sa Chéinia: thairg sé an lámh láidir do na treallchogaithe agus lámh an chara dóibh siúd nach raibh sáite sa chogaíocht. Thug sé a fhaomhadh do thógáil na sráidbhailte daingnithe, fosta. Ba chleas oirbheartaíochta é seo a d'éirigh coitianta i gcogaí coilíneacha nó iarchoilíneacha na nEorpach is na Meiriceánach i ndiaidh a lae féin. Dream eitneach a bhí ag cur an chogaidh sa Mhalaeisia, agus cuidiú ag teacht ón Aontas Sóivéadach. Mar sin, bhí i bhfad níos mó tacaíochta ar fáil don Bhreatain Mhór anseo ná sa Chéinia nó san Iaráin. Nuair a shroich an cogadh a bhuaicphointe, bhí 35,500 saighdiúir de chuid na Breataine Móire ar garastún sa Mhalaeisia. Agus na reibiliúnaithe ag cailleadh an fhóid, bhí siad cailleadh thacaíocht na ndaoine chomh maith. Siúd is go bhfuarthas an lámh in uachtar ar na treallchogaithe, bhí an chuma ag teacht ar an scéal go soiléir nach raibh sé indéanta a thuilleadh an Mhalaeisia a choinneáil faoi smacht na Breataine Móire. Sa bhliain 1953, leagadh amach treoirlínte an neamhspleáchais do Singeapór agus do na coilíneachtaí eile sa chearn seo den domhan. Bhí an chéad toghchán ann, sa bhliain 1955, cupla lá sular éirigh Churchill as an bPríomh-Aireacht, agus sa bhliain 1957, i ndiaidh d'Antony Eden teacht i gcomharbas ar Churchill mar Phríomh-Aire, bronnadh an neamhspleáchas ar an Malaeisia. Ón mbliain 1941 go lá a bháis, bhí an oifig oinigh aige ar a dtugtar Lord Warden of the Cinque Ports. Sa bhliain 1953, bronnadh dhá chéimíocht thábhachtacha air, nó fuair sé Ridireacht an Ghairtéir, agus é ag tabhairt "Sir Winston Churchill KG" air féin feasta, agus, sa bhreis air sin, bronnadh Duais Nobel na Litríochta air "as ucht a mháistreachta ag tabhairt cur síos ar imeachtaí beatha agus staire agus as ucht a dheisbhéalaí ag cosaint luachanna móra an duine". Sa bhliain chéanna, áfach, fuair sé stróc a d'fhág pairilis ar an taobh deas dá cholainn. D'éirigh sé as an bPríomh-Aireacht ar chúiseanna sláinte ar an gcúigiú lá de Mhí Aibreáin, 1955, ach choinnigh sé a phost mar Sheansailéir ar Ollscoil Bhriostó. Níor thug sé suas a Fheisireacht ach an oiread roimh an mbliain 1964. Sa bhliain 1959, gaireadh Athair an Tí de, is é sin, an duine ab fhaide a bhí ina Fheisire gan stad. Sa bhliain 1955, tairgeadh diúcacht do Churchill, agus piaracht aige cheana féin. Ar dtús, bhí sé an-tugtha don smaoineamh, agus é ag pleanáil Diúc Londan a thabhairt air féin. Sa deireadh thiar, áfach, dhiúltaigh sé, mar a chomhairligh a mhac Randolph dó a dhéanamh. Ó sin i leith, níor bronnadh diúcachtaí ach ar bhaill de theaghlach ríoga na Breataine. Sa bhliain 1956, bhronn Cathair Aachen in iarthar na Gearmáine Karlspreis nó Duais Shéarlais Mhóir ar Churchill, de bharr a raibh déanta aige ar mhaith leis an gcomh-Eorpachas agus leis an tsíocháin san Eoraip. Sa bhliain 1963, fuair Churchill saoránacht oinigh na Stát Aontaithe, roimh aon duine eile. Ar an dara lá de Mhí Mheán Fómhair den bhliain 1908, phós Churchill Clementine Hozier in Eaglais Naomh Mairéad, teampall galánta Anglacánach in aice leis an bParlaimint. Cailín deas dathúil ab ea í, siúd is nach raibh mórán maoin shaolta ag a muintir. Bhí aithne ag Churchill ar an gcailín ó casadh air ag cóisir í i Mí na Márta sa bhliain chéanna. Roimhe sin, bhí Churchill i ndiaidh ceiliúr pósta a chur ar an aisteoir clúiteach Ethel Barrymore, ach d'eitigh sí. Saolaíodh cúigear clainne dóibh, mar atá, Diana, Randolph, Sarah, Marigold, agus Mary. Bhásaigh Marigold ina páiste. Chuaigh Sarah le haisteoireacht, agus rinne sí príomhpháirt ar an scannán Royal Wedding, in éineacht leis an bhfear mór rince féin, Fred Astaire. Scríobh Mary leabhar faoina tuismitheoirí. B'í an Bantiarna Blanche Henrietta Ogilvy máthair Chlementine, agus í ar an dara bean chéile ag Sior Henry Montague Hozier. Níl a fhios ag aon duine, áfach, cérbh é athair Chlementine dháiríre, nó is feasach nach raibh a máthair ró dhílis dá fear céile: sin é an tuige go bhfuair sí colscaradh sa deireadh. Thug sí féin le fios gurbh é an Captaen William George "Bay" Middleton a ghin an iníon, ach is é tuairim Joan Hardwick, a scríobh beathaisnéis Chlementine, gurbh é Algernon Bertram Freeman-Mitford, fear céile le deirfiúir Chlementine, a ghin an chlann ar fad a rugadh do Blanche Henrietta Ogilvy. Chuaigh mac Churchill, Randolph, agus a gharmhic Nicholas Soames agus Winston le polaitíocht, agus vótáladh isteach sa Pharlaimint iad. Nuair nach raibh Churchill i Londain ag tabhairt aire do chúrsaí polaitíochta, bhí sé ina chónaí i Chartwell House i gKent, faoi dhá mhíle ó dheas de Westerham. Eisean agus a bhean chéile, cheannaigh siad an áit sa bhliain 1922, agus chónaigh Churchill ansin go lá a bháis. Nuair a bhí sé ag cur faoi i Chartwell, chaitheadh sé a chuid ama ag scríbhneoireacht, ag péintéireacht, ag brícléireacht nó ag adhradh na n-ealaí dubha Astrálacha a thuill a clú don áit. Bhí a fhios ag Churchill nach ag éirí óg a bhí sé. Mar sin, d'fhág sé slán ag oifig an Phríomh-Aire sa bhliain 1955. Tháinig Anthony Eden i gcomharbas air, rud a raibh sé ag súil leis le fada an lá anuas. Chaith Churchill an chuid ba mhó de bhlianta deireanacha a shaoil ag Chartwell agus i ndeisceart na Fraince. Sa bhliain 1963, bhronn John F. Kennedy (Seán Mac Gearailt Ó Cinnéide), uachtarán na Stát Aontaithe, Saoránacht Oinigh na Stát Aontaithe ar Churchill. Níor bronnadh na honóracha seo ar aon duine roimhe sin. Ní raibh Churchill in ann freastal ar an searmanas, chomh tinn agus a bhí sé, agus b'iad a mhac agus a gharmhac a ghlac leis na dintiúirí thar a chionn. Ar an 15ú lá de Mhí Eanáir 1965, buaileadh Churchill le stróc an dara huair - is é sin, le trombóis thromchúiseach inchinne. Níor tháinig sé as, an turas seo. Bhásaigh sé naoi lá ina dhiaidh sin, ar an 24ú lá de Mhí Eanáir 1965, cothrom lá báis a athara, seachtó bliain ina dhiaidh. Bhí a chorpán le feiceáil i Halla Westminster ar feadh trí lá, agus chóirigh stát na Breataine Móire searmanas a adhlactha in Ardeaglais Naomh Pól. Bhí sé ar an chéad duine a fuair sochraid Stáit i ndiaidh an Mharascail Mhachaire, an Tiarna Roberts of Kandahar, a d'éag sa bhliain 1914. Tugadh an leathanach seo cothrom le dáta an 15 Márta 2019 ag 23:10.